I have been wanting to make a vanilla cake for sometime. The first time I made this cake I did not bake it long enough and the batter was too wet and doughy. It can be tricky when you are baking with gluten free flour. Ugh it was so disappointing I had to throw it out. The second time I made the cake it fell apart, yet the flavor was good. Well, third time was a charm. I used my own flour blend, which made all the difference. I baked the batter in 2 8-inch rounds, one for today and I will freeze the second round. You could also double the recipe and make this a show stopping tall cake for a special occasion. Since I baked this for me and my honey for Valentine’s Day, one round is enough. Preheat oven to 350 degrees. Grease or parchment line baking dish/pans. Sift together dry ingredients: flour, xanthan gum, sugar, baking soda, and salt. In a separate bowl combine wet ingredients. Mix thoroughly. Add wet ingredients to the dry ingredients and mix completely. Pour batter into baking pans evenly. Bake for 30-35 minutes. Do the toothpick test (toothpick should come out clean). Remove from oven and cool completely. Note: You can also bake this in a 13×9 baking dish, it may take a little longer to bake. In a small bowl combine strawberries and sugar. Let set in refrigerator for about 45 minutes. Add cashews and water into blender. Let stand for about 45 minutes, or until cashews are softened. Drain water. Add vanilla powder and salt to cashews. Blend until creamy. Add strawberry mixture. Do a taste test, if needed add confectioners sugar. The confectioners sugar will sweeten as well as thicken the frosting. Thank you. It really is delicious. Thank you. It is so good. What is vanilla powder? Oat milk? Hi Tish. Vanilla powder is like vanilla extract in powder form. You can use vanilla extract instead. Oat milk is made with oats and water, blended together. I should have a link in the recipe to show you how to do this. It is very simple. 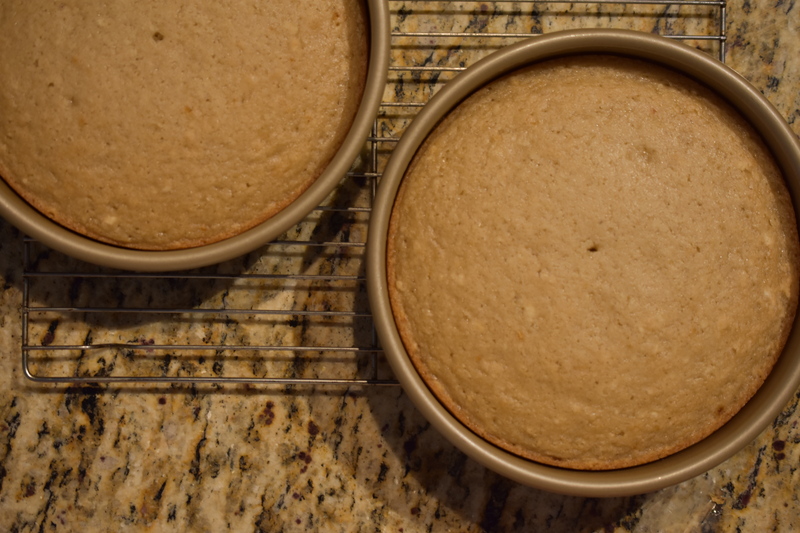 The oat milk helps to give the cake a golden color. Thanks for stopping by Cathryn’s Kitchen.